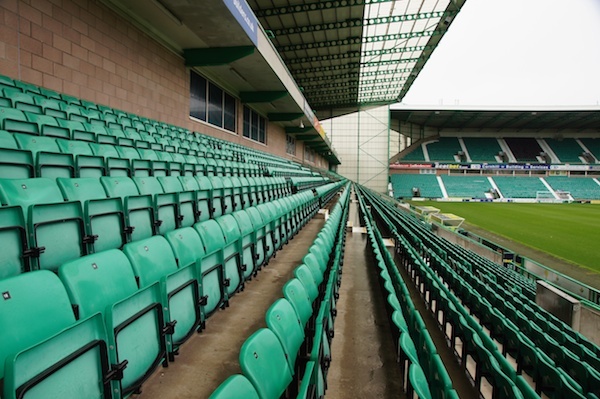 Hibs and Queen of the South are to join forces to mark the 100th anniversary of The Great War at the forthcoming match at Easter Road on Saturday 15 November (kick off 3pm). Hundreds of free tickets are being made available through both clubs to veterans and their families, and also to current servicemen and women and their families. The Club is working with a number of organisations, including Tickets for Troops and Legion Scotland. Hibs’ Head Coach Alan Stubbs launched the initiative with three soldiers from the Royal Artillery, Gunner Luke Kilby, Gunner Peter Stanley and Gunner Courtney Lewis, who will all be attending the match. Any veteran, or member of the Armed Forces, interested in attending the match for free can do so via the Tickets for Troops website (https://www.ticketsfortroops.org.uk/sports). The players will wear a one-off shirt for the match against Queen of the South in remembrance of those who gave their lives in conflict. The home shirt worn by the players will feature a poppy symbol with the words: ‘In Flanders fields the poppies blow’ written underneath. The quotation is from a famous war poem written by Scots Canadian field surgeon Major John McCrae.